Popular children's characters the Mr Men will return to British TV for the first time in more than a decade. Twenty five of the Mr Men and Little Miss characters will return in a new animated series, The Mr Men Show, on channel Five next year. Created by Roger Hargreaves, the Mr Men books celebrated their 35th anniversary last year with an exhibition in London. Their adventures first appeared on TV in 1974, narrated by Arthur Lowe, with later series in 1983 and the mid 1990s. The latest series will feature as part of Five's morning Milkshake! slot. "The new Mr Men Show is a funny and engaging programme that will sit perfectly within the Milkshake! strand," said Five's controller of children's programming Nick Wilson. 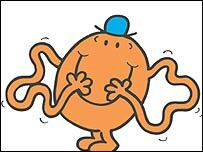 Mr Tickle, the first Mr Men book, kicked off the original book series in 1971; the Little Miss series followed in 1981. His son Adam began writing and illustrating the new stories, following Hargreaves's sudden death in 1988. The Mr Men and Little Miss book titles were sold to entertainment group Chorion in 2004 in a £28m deal. "We are very excited to be again working with Chorion to bring Roger Hargreaves's much-loved characters to a new generation of viewers," said Five's Mr Wilson.